Over the last couple weeks I've been studying other builder's blogs, reading pages and pages of Van's Airforce articles / threads and generally trying to get a handle on best practices for working with CS-3204 B-2 (Seal Pro) for sealing up the gas tanks. I've accumulated popsicle sticks, gloves, acetone, mixing bowls, various (cheap) brushes, applicators, paper towels, ink brayers, etc. in preparation for working with the smelly gooey mess. Today I finally dived in- yes it is stinky, gooey, and not that much fun to work with. I started out by sealing up the mandrel holes in the end ribs with AN470-AD6 rivets. The rivets supplied with the kit were length 6 which is overkill for plugging a hole, so I cut them down to a 5 using my rivet cutter. I was able to wet set them using my C-Frame and a heavy hammer. Next I riveted on the fuel flanges. I was going to use the squeezer, but the rivets were too close to the neck of the flanges for the squeezer to fit so I ended up using the rivet gun and bucking bar. The procedure I used was to butter the back of the fuel flange and place it on the rib (the sealant holds it in place). Then I dabbed sealant on the rivet holes and inserted the rivets. Then I buttered the shop side of the rivets before setting the rivets with the rivet gun. After setting all the rivets I went back and dabbed on more sealant for good measure. Here's what I got done before the first batch started getting a little too stiff to easily apply. I was trying to make it look pretty, but now I'm thinking I'll be happy to settle for just making it leak free. I'll have to work faster in future build sessions. The temperature was in the mid 40's in the garage this afternoon. Here's some of the supplies. The electronic postal scale I just purchased at Office Max died so I pulled out my trusty gram scale that I normally use for building indoor models. Sometimes old analog tech rules ;-) I'm using paper bowls for mixing- easier to mix in a bowl than a cup. I'm using acetone for clean up. I assembled the right tank, match drilled the j-stiffener and counter sank the holes for the tank baffle. Slow going on these countersinks so as to not elongate the holes. They all go to a knife edge - the tank baffle acts as a backing guide for the countersink bit. Every 10th hole is left not counter sunk so the parts can be accurately clecoed together for final assembly and riveting. After the pro seal cures you go back and countersink and rivet the remaining holes. I've been busy with Xmas, skiing and programming lately, but today I put in some work on the tank. I finished counter sinking the rivet holes for the joint to the tank baffle. I also scuffed up the skin where the ribs and stiffeners will be joined to help with the pro seal bond. After scuffing, I dimpled the holes using both the DRDT2 and C-frame for the hard to reach holes. Counter sinks go to a knife edge- I went slow and careful on these. I taped off the areas to be scuffed and used the 3M polish pad in the air drill. Large dimples are #8 die- be careful with deburring before dimpling to avoid cracks. I roughed up the fay surfaces of the tank stiffeners and then deburred and dimpled the mating holes. 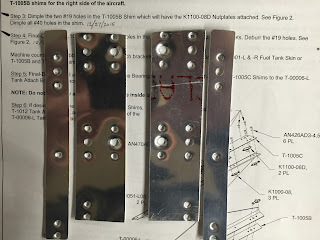 Then I worked on the z stiffeners- filed and polished edges, final drilled and countersank holes, cut to length, deburred and riveted nut plates on. Edge finishing the z brackets. I hold the file perpendicular to the work and start from one end and work to the opposite end. I finished up by cutting the j stiffener to length and then match drilled it to the tank skin. Today I final drilled holes, deburred holes, dimpled holes, rechecked flanges for 90°, deburred and polished flanges, deburred the large holes in the ribs and smoothed the edges around the nose of the ribs. I think I'm done prepping the gas tank ribs for both tanks. I spent the rest of the day cutting and finishing skin stiffeners for the tank. The provided channel sections had holes drilled to locate the angles and edges. I taped all the channels together and cut the individual pieces to length. Then I build a couple jigs to help cut the angles accurately and quickly. After cutting on the band saw, I sanded the edges on the belt sander to final shape and then polished all the edges on the grinder with the scotch bright wheel. I cut a simple angle guide out of a 2x4 that slides along the parallel guide. I aligned the channel piece with the rear guide hole over the blade cut in the 2x4 and then ran it through the band saw. Perfect cut every time. Jig for cutting reverse angle- had to make jig that worked with the 90° guide, but works the same way as guide above. Cut and edge polished parts. First thing this morning I tackled the hard to reach rivets at the nose. I'll admit, even starting fresh first thing in the morning I still ended up drilling a few out. It's a hard reach all the way into the nose section and its hard to buck rivets at the max curvature portion of the airfoil. I also riveted in the access door frame, landing light mount and the j-stiffener. It appears everything lined up nicely, but final alignment will occur when this gets attached to the spar in a couple weeks. Heres some shots of with all the rivets in place. After lunch I clecoed the right outboard leading edge together and riveted the ribs almost to the nose. Work went much faster after learning how to do it with the left assembly. By the end of the day I had put in all but the last couple rows of rivets. It gets progressively more difficult the further into the wing section you go because the curvature is greater and the reach is longer.